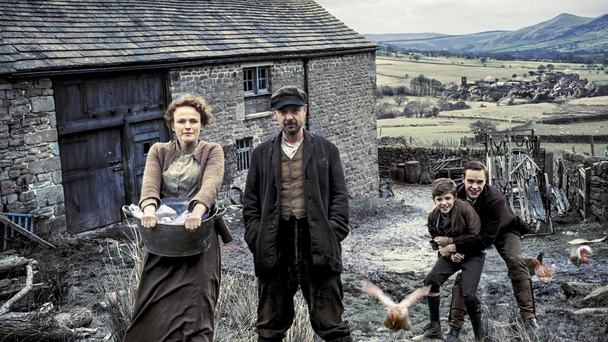 The BBC’s brand new drama series – The Village – begins this evening, starting Maxine Peake, John Simm, Juliet Stevenson, Nico Mirallegro, Bill Jones and David Ryall. The Village is an epic drama series charting the life and turbulent times of one English village across the whole of the 20th century. Bert (Bill Jones) is twelve years old and his days are filled with school, his friends, working in the fields with his father and secret swimming lessons with his older brother Joe (Nico Mirallegro), whom he adores. Joe is nineteen and handsome. He works for the Allingham family (Juliet Stevenson and Kit Jackson) at the big house. The Middleton family are poor: the farm has been in the family for five generations, but life is a struggle for the boys’ parents, John and Grace (John Simm and Maxine Peake). John has turned to drink, and is killing himself trying to get the harvest in on his own – work that should be done by a whole team, but John is not a popular man in the village. Bert is the only help John has on the farm, and he tries to take Bert out of school. But Bert’s teacher and mentor, Gerard Eyre (Matt Stokoe), refuses to let him: a boy needs an education. The first ever bus to stop in the village arrives. Everyone in the village gathers to see it – and off the bus steps the beautiful, headstrong Martha Lane (Charlie Murphy). Young Bert Middleton’s (Bill Jones) world will never be the same again. George Allingham (Augustus Prew) is also smitten by her, but Martha really only has eyes for Bert’s older brother, Joe. son Joe (Nico Mirallegro) due to head off to war, how will the family survive? must prepare themselves for tough times ahead. The first episode of six is on BBC One and BBC One HD at 9pm tonight!